18650 battery FST chemistry 3,7 V 2500 mAh LiCoMnO2 tabs 20A / 8C. minimum 2400 max 2600 mAh. particularly suitable for rotors / screwdrivers / drills, excellent quality. 18 X 65 CM X 45 GRAMS. 18650 battery FST chemistry 3,7 V 2200 mAh LiCoMnO2 tabs 20A / 8C. minimum 2000 max 2400 mAh. particularly suitable for rotors / screwdrivers / drills, excellent quality. 18 X 65 CM X 43 GRAMS. Tipo 18650. Caution, battery without protection. Do not dispose of in common containers. Do not throw in water. Do not disassemble and reassemble. Do not expose to excessive heat. Capacity: 5200mAh. Capacity 5200mAh. Fuses & Circuit Breakers. Cable Reels, Extension Cables & Trailing Sockets. Computer Cable Assemblies. Soldering Iron Stands. Test Connectors. Battery chemistry: Li-Ion. Tipo 18650. Caution, battery without protection. MPN Non applicabile. Do not dispose of in common containers. Do not throw in water. Do not disassemble and reassemble. Do not expose to excessive heat. 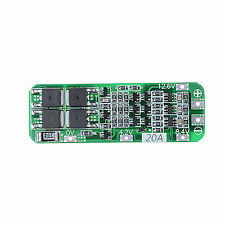 1 PCS x 3 string 12.6V 20A 18650 lithium battery protection board. Maximum output current: 20A. 59 20 3.4mm. Features: 100% brand new and high quality. No memory effect & Environmentally friendly. Battery Appliance: flashlights, emergency lighting, portable devices, power tools. Specifications: Capacity: 6000mAh Voltage: 3.7V Chemistry: Li-ion Recharge: up to 1000 cycles Color: black Size: 65*17mm Weight: 35g Package included : 1 x battery Notes:. 3 series 18650 battery 10.8V 11.1V 12.6V. Short circuit protection. Internal resistance: <100mΩ. 1 x Protection PCB Board. Overcurrent protection. Storage temperature: -40~80°C. Service life: >30000hours. 18 X 65 CM X 46 GRAMS. Do not expose to excessive heat. 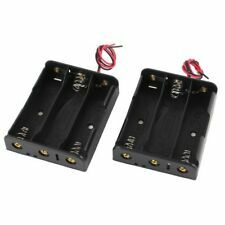 2x 18650 9800 mAh 3.7v ★ ★ ★ ★ ★ ★. Good for use in torches. NOT FOR USE IN E CIGARETTES. 1pc Storage Box. Capacity: 3400mAh (Min 3250mAh). A heat resistant layer to make this power cell safer to use. Rechargable battery. Features: Discharge rate, no "memory effect". Low reoccurring operation cist, Short -circuit and over-current protection. Good quality and durable. Provides excellent continuous power sources to your device. Safe and environment-friendly. Descriptions: Overcharge and discharge protection. Keep in a dry and cool place. Anti-corrosive housing can effectively protect battery and prolong its lifetime. Specifications: Color: red. Capacity: 5000mAh. Model: 18650. Battery capacity refers to the battery storage capacity. Short-circuit and over-current protection. Keep in a dry. for it free. To Other Country. Capacity 3400mAh. 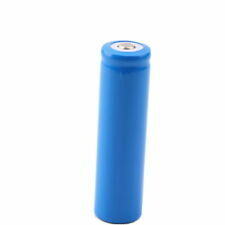 Battery for Flashlight FB0007.804. Protection Circuit Modules (PCM) Battery Type Lithium-ion (Li-ion). WEEE & Waste Portable Battery Regulations. We are most happy to help! Product Information. Features: . Short circuit and overcurrent protection. . Safe for you to use. Specifications: Color: red Battery Model: 18650 Battery Voltage: 3.7 V capacity: 9800 mAh Size:1.8x1.8x6.5cm Package Included: 1 x 18650 Battery Notes:. Features: . Short circuit and overcurrent protection. . Safe for you to use. Specifications: Color: red Battery Model: 18650 Battery Voltage: 3.7 V capacity: 9800 mAh Size:1.8x1.8x6.5cm Package Included: 1 x 18650 Battery 1 x EU charger Notes:. 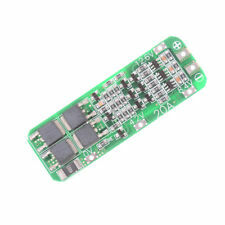 Perfect for DIY, you can connect multiple holders and batteries in parallel. This battery box holder with wire leads. With spring clip design, easy to install and remove a battery. 1 x Battery Case. Features: . Short circuit and overcurrent protection. . Safe for you to use. Specifications: Color: red Battery Model: 18650 Battery Voltage: 3.7 V capacity: 9800 mAh Size:1.8x1.8x6.5cm Package Included: 1 x 18650 Battery 1 x US charger Notes:. Tipo 18650. Do not expose to excessive heat. Materials, projects and production processes compete to reach a certain level of product quality. Do not disassemble and reassemble. 3XGenuine Efest Purple IMR 18650 2500mah 35A Battery Flat Top - Original 100%. Genuine single Efest IMR 18650 LiMn 2500mAh 35 Amp Flat Top Battery. These batteries have been engineered for high drain application and heavy load usage. 4XGenuine Efest Purple IMR 18650 2500mah 35A Battery Flat Top - Original 100%. Genuine single Efest IMR 18650 LiMn 2500mAh 35 Amp Flat Top Battery. These batteries have been engineered for high drain application and heavy load usage. Caution, battery without protection. no pcb, but safe, with security. MPN Non applicabile. Do not dispose of in common containers. Do not throw in water. Do not disassemble and reassemble. Do not expose to excessive heat. Tipo 18650. length 69 mm x 19 mm pcb high quality seiko. Do not dispose of in common containers. Do not throw in water. Do not disassemble and reassemble. Do not expose to excessive heat. Materials, projects and production processes compete to reach a certain level of product quality. Capacity: 3400mAh (Min 3250mAh). A heat resistant layer to make this power cell safer to use. Rechargable battery. Weight : 47g/pc. 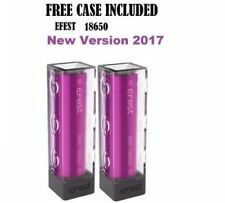 2XGenuine Efest Purple IMR 18650 2500mah 35A Battery Flat Top - Original 100%. 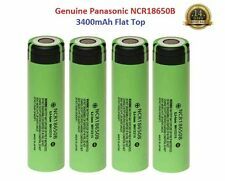 Genuine single Efest IMR 18650 LiMn 2500mAh 35 Amp Flat Top Battery. These batteries have been engineered for high drain application and heavy load usage. Features: 2 independent charging channels with built-in micro-computer management system to ensure the high efficiency. Micro USB input; USB 5V 1A output port for charging your cell phones two charging current options: 0.5A, 1A. charging modes: constant current and voltage. LED indicators show the charging process and battery type. automatically detects battery type and battery under your selected charging current. Tipo 18650. 1 battery for sale, the photo is demonstrative / explanatory. Do not throw in water. Do not disassemble and reassemble. Do not expose to excessive heat.